‘Logan Lucky’ is Steven Soderbergh’s return to filmmaking, if you can ever truly say he was away, and it’s a brilliantly funny heist caper in the vein of the Coen Brothers. Set in North Carolina, the film follows two down on their luck brothers (Channing Tatum and Adam Driver) who decide to formulate a plan to rob the Charlotte Motor Speedway during a high profile NASCAR race. To put this plan into action they assemble a motley crew comprising of their sister (Riley Keough), an incarcerated explosions expert (Daniel Craig) and his hillbilly brothers (Brian Gleeson and Jack Quaid), with the stupidity of those involved contrasting nicely with the intricate planning. The plotting is undoubtedly far fetched and implausible, but does it really matter when it’s this much fun? 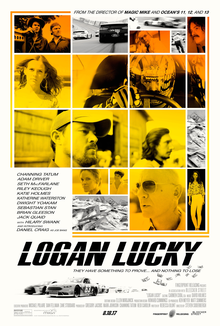 Soderbergh is no stranger to the heist movie after his work on the Ocean’s trilogy, but where those films were all glitz and glamour, ‘Logan Lucky’ is a lot dustier and dirtier, and it has a bit of heart underneath the comical plotting that forms it’s main focus. I think part of why I enjoyed ‘Logan Lucky’ so much is that it is abundantly clear that everyone is having an absolute ball, from the entire cast to Soderbergh himself, and it’s full of hilarious little vignettes and moments that make it a real hoot. Tatum and Driver are both good as the Logan brothers but it’s a bleach blonde Daniel Craig who really steals the show as the appropriately named Joe Bang, a thoroughly brilliant and memorable character. The only real misstep is an unusual role for Seth MacFarlane as a British racing driver who flits in and out of the plot, and whilst this is a funny movie, his comedy feels a little broad and out of sync with the rest of the film. I thought ‘Logan Lucky’ was a superb piece of entertainment and a welcome return from Steven Soderbergh, with great oddball characters and an efficient piece of storytelling that was always funny. One thing is clear. Steven Soderbergh movies do not have an entertainment problem!